Add Bluetooth 2.0 with EDR capabilities to a computer, through USB. 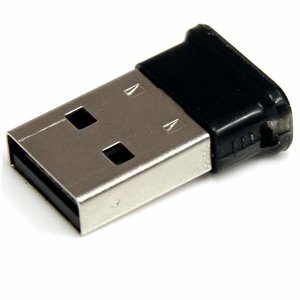 The USBBT1EDR2 USB to Class 1 Bluetooth Adapter with EDR is a micro-sized adapter that adds Bluetooth capabilities to a computer through an available USB port. This makes it possible to connect to devices wirelessly, at ranges up to 100m (328ft), with minimal power consumption.The USB-Bluetooth Adapter supports the Bluetooth v2.1 specification, along with Enhanced Data Rate (EDR), for transfer rates up to 3 Mbps. The adapter uses a small form factor design that makes it conveniently portable and unobtrusive, when connected to a computer. The USB-Bluetooth Adapter supports the Bluetooth v2.1 specification, along with Enhanced Data Rate (EDR), for transfer rates up to 3 Mbps. The adapter uses a small form factor design that makes it conveniently portable and unobtrusive, when connected to a computer. Backed by a StarTech.com 2-year warranty and free lifetime technical support.